Video analysis reveals that veterinarians have much to learn about how best to communicate with clients when it comes to this sensitive topic. The typical approach to feline and canine weight control is dietary management. The American Animal Hospital Association recommends that nutritional assessments occur during each veterinary visit to provide a window into a pet’s nutritional status and help veterinarians establish a partnership with the pet’s owner to help maintain or improve a pet’s health. Feline office visits are less frequent than canine visits,4 resulting in missed opportunities to address and manage obesity. To date, very little is known about how veterinarians and cat owners really interact during clinical appointments when feline obesity is discussed. 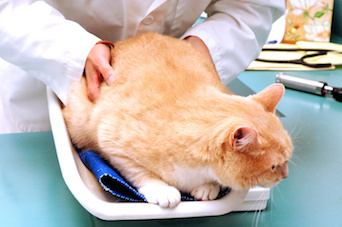 A team of Canadian investigators recently sought to understand this by analyzing video recordings of feline veterinary visits.5 Their findings shed light on communication strategies used by both veterinarians and clients when discussing feline obesity and can serve “as an important starting point for veterinarians to consider in their own practices regarding sensitive topic discussions,” they wrote. The investigators screened 284 video-recorded appointments from several small animal veterinary practices in Ontario, Canada. Of these, 123 were feline appointments. From these 123 appointments, 25 met the study’s inclusion criteria—at least 2 back-and-forth exchanges between the veterinarian and the client regarding a cat’s obesity. The videos were analyzed qualitatively for verbal and nonverbal communication. Verbal discussions were transcribed. A thematic analysis of the videos was also performed to identify themes and subthemes in communication between the veterinarian, the client, and the patient. The 25 appointments were conducted by 12 veterinarians, 75% of whom were female; most clients (72%) were also female. Nearly all clients had worked in the past with the veterinarian conducting the appointment. Nineteen of the 25 appointments included obesity and diet discussions, and 6 included obesity prevention discussions. Veterinarians initiated most of these conversations. In addition, most discussions occurred during wellness visits, rather than during visits for specific health problems. The depth, duration, and complexity of obesity dialogue varied widely. A handful of the veterinarians contributed to over half of the obesity discussions. Interestingly, in all but 1 case, obesity was not the reason for the appointment. The researchers identified 3 main themes: communication alignment/misalignment between veterinarian and client, patient-directed speak, and oblique or absent messaging. Regarding weight management, a client suggested a dietary change during an appointment; the veterinarian, however, recommended reducing ration size. Also, this client repeatedly asked for the veterinarian’s assessment on food choice appropriateness, but the veterinarian provided only vague answers and dropped the topic. Dropping the topic may ease tension, the investigators noted, but it also creates ambiguity for clients and signals a missed opportunity for a conversation about effective weight management. Rather than dropping the topic, the authors recommended a helical approach, in which a topic is repeatedly circled back to during a discussion. Clients became resistant during appointments if they did not agree with the veterinarian or if the veterinarian singularly pursued an obesity discussion. Some veterinarians, when met with resistance, altered their communication strategy. This often meant at least partially abandoning their recommendations and attempting to circle back to the resisted topic. In one visit, though, the use of humor backfired. A veterinarian used humor to undermine his colleague’s assessment of a cat’s weight. The cat’s owner, who had made changes to her pet’s diet based on that colleague’s assessment, became tense and less engaged. Unfortunately, the veterinarian did not perceive this tension, continued to use humor ineffectively, and ultimately dropped the topic.